Meyer lemon growing can be grown outside in USDA Hardiness Zones 8-11. Those in more northern areas successfully grow Meyer lemons in large containers that are overwintered indoors, away from freezing temperatures. Caring for a Meyer lemon tree is simple when you follow a few basic steps. We’ll list them here for those who may be having difficulty growing these lemons and for those new to Meyer lemon growing. You may be wondering, what are Meyer lemons? Today’s Meyer lemon trees are a hybrid released to the University of California in 1975. Before that, the Meyer lemon tree was imported from China. While it became increasingly popular in the United States, it was highly susceptible to disease and actually banned because of it penchant for spreading a devastating virus to healthy fruit trees. Today’s Improved Meyer Lemon dwarf is something of a cross between an ordinary lemon and an orange. The thin-skinned fruit is sweet and grows readily in the right conditions. The tree reaches 6 to 10 feet in height. Pruning keeps it more manageable with a fuller appearance. It is self-pollinating, which means you need only one tree in order to get fruit. Meyer lemon tree care is basic, but don’t deviate from the rules if you want to be successful. Meyer lemon tree care includes finding the right location for your tree. Whether grown in a container or planted in the ground, Meyer lemon growing requires at least six hours of sunlight. In the hottest summer areas, morning sun and afternoon shade is best for growing Meyer lemons. Start with a healthy tree, grafted onto a hardy rootstock. Seed grown trees are often unhealthy and may not reach the point of flowering or producing fruit. Soil conditions when growing these lemons should be well-draining; however, the soil must hold enough water to remain moist. Allow soil to dry out only slightly between waterings. Fertilize regularly when growing Meyer lemons. 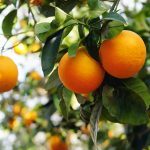 A high nitrogen fertilizer, such as one designed for citrus trees, is best fed monthly between April and September. Withhold fertilizer during autumn and winter months. Yellowing leaves indicate the need for either water or fertilizer. Prune lemon fruit clusters to one or two fruits when the little lemons are marble sized. Pruning before fruit develops, removing all but one bud in a cluster, is also an effective way to grow larger lemons.